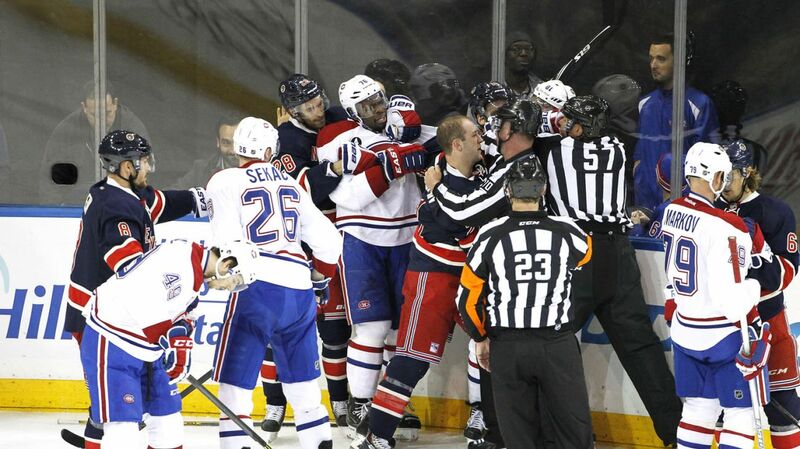 Things got fiesty when the Rangers last played the Canadiens. Photo courtesy of MSG Photos. The Rangers (3-1-0) will look to win their fourth home opener this season as they head into the Bell Centre to take on the undefeated Montreal Canadiens (4-0-0) when they play in front of their home fans for the first time this season. Alain Vigneault and his team carry their perfect road record (2-0-0) and home opener record (3-0-0) into the loud, rowdy and hostile home of the Canadiens, one of the best teams in the NHL through the first few games. Montreal is led by captain Max Pacioretty, who is tied for the league lead in goals (4) and second in points (6). Andrei Markov and PK Subban, both excellent defenseman, have each tallied four assists to start the season, and Tomas Plekanec has three goals in the Canadiens’ four games. Ultimately, this game will come down to goaltending. Henrik Lundqvist versus last year’s Vezina trophy winner, Carey Price. Price is off to a magnificent start to the 2015-16 campaign, winning each of his three starts and posting a 1.67 GAA and a .945 save percentage. Henrik Lundqvist has started all of the Rangers games so far, and is looking to rebound from a loss to the Winnipeg Jets. Lundqvist has allowed just two goals or fewer in five of his last six starts against Montreal, as well as one goal or fewer in three of those games. He has a 1.53 GAA, a .936 save percentage and a shutout in his last six appearances against the Canadiens. Lundqvist is on a roll in the regular season as well. Dating back to December 8th, 2014 against the Penguins, Lundqvist is 24-7-0 in his last 31 regular season games, along with a 1.98 GAA, a .934 save percentage and a shutout. Seven of the last eight games between these two teams has resulted in a shutout, so expect a goaltending duel between Lundqvist and Price. 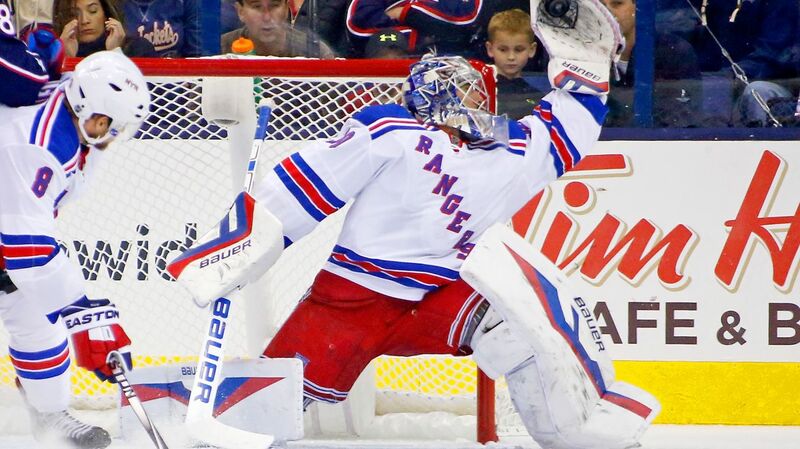 Vigneault wisely stuck with the hot hand in Lundqvist, but he’ll be changing the rest of the lineup. After getting a look at Dylan McIlrath, however limited that was, Dan Boyle found himself back on the second pairing with Marc Staal. Jarret Stoll and Tanner Glass were skating as extras after a horrific possession game from the fourth line, and Jesper Fast was back in the lineup. 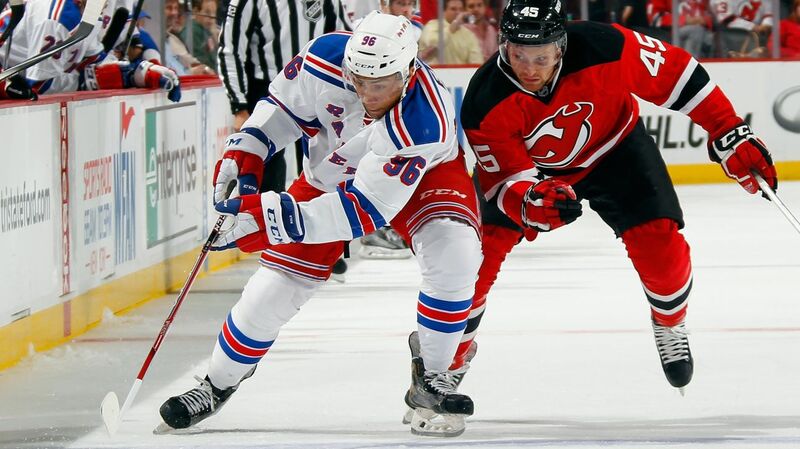 Emerson Etem will make his New York Rangers debut tonight after spending the first four games in the pressbox. The talented winger appears to be on a line with Dominic Moore and Jesper Fast. While this is the fourth line, there’s no denying that both Moore and Fast have some offensive talent. Etem will get chances to score and go on the attack, but he’ll need to prove that he can be physical and defensively responsible as well. Viktor Stalberg is the Rangers third liner that isn’t getting enough recognition for his contributions so far. He’s quietly racked up three assists in four games, and his size and aggressive forecheck is creating a lot of open ice for Oscar Lindberg and JT Miller to work with. He’s a big reason why Lindberg has four goals, and I think he’ll break through and get his first tonight. Stalberg has registered a point in four of seven career games against the Canadiens (2-4-6), including two multipoint performances in his last five contests versus Montreal. Kevin Hayes is another player to watch for in tonight’s game. Hayes has fit in great on the second line, effectively playing the playmaker role from the wing. Hayes has tallied a point in each of his last four road games, totaling seven points (3-4-7) in those games. He also has totaled 13 points (4-9-13) in his last 12 road games. The Rangers and Canadiens will face off at the Bell Centre at 7 PM. The game will be broadcasted on MSG Network. Posted on October 15, 2015, in Game Previews and tagged Alain Vigneault, Carey Price, Chris Kreider, Dan Boyle, Dan Girardi, Derek Stepan, Derick Brassard, Dominic Moore, Dylan McIlrath, Emerson Etem, Jarret Stoll, Jesper Fast, JT Miller, Keith Yandle, Kevin Hayes, Kevin Klein, Madison Square Garden, Marc Staal, Mats Zuccarello, Max Pacioretty, Montreal Canadiens, MSG, New York Rangers, New York Rangers blog, NHL, NYR, Oscar Lindberg, Rangers, Rangers blog, Rangers Season Opener, Rick Nash, Ryan McDonagh, Subban, Viktor Stalberg. Bookmark the permalink. Leave a comment.